Our parents are awesome. We don’t have a babysitter here in Kalamazoo because our primary need is at at 2:00 in the morning. Things get really stressful if I have to stay late at work or J has to go in early. We can’t just call someone at 2 A.M. and ask if we can drop the kids off. Our employers both know the situation and they (begrudgingly sometimes) accept it. It’s funny because J and I work in the same industry and our employers are in direct competition with each other. When we run into these situations in advance, one of our parents can usually come to stay with the kids overnight. J’s parents live two hours away while mine live three, so it can’t be a last minute thing. This last week was hectic for us at work. We were worried about Monday night. It was looking like I was going to have to stay pretty late and getting home by 2:30 was going to be challenging. Just to be safe, my mom offered to come up and sleep at our house then watch B so I could get a nap in after we took L to school. L was really exciting about showing my mom and my aunt (who came along for the ride) her “new” school. I swapped the car seats out of my truck and in to my mom’s van so we could all drop L off at school Tuesday morning. It was kind of a late night for everyone so I asked if anyone was interested in breakfast. L’s school is in the Westnedge Hill Neighborhood so when both my mom and aunt said yes, I knew exactly where to go. 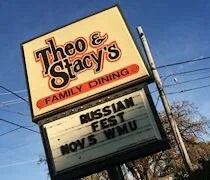 Theo & Stacy’s has been in Kalamazoo for over forty years. The first restaurant was a small restaurant in downtown Kalamazoo. The downtown restaurant has moved and changed names and they’ve added one in Portage near the airport and one on Westnedge near Kilgore. We headed towards the Westnedge location around 8:30 on a Tuesday morning. Most of the parking near the front was already taken up and it had started to rain. I found a spot as close as I could in the back lot then we all made a dash for the door which faces Pratt Road. The sign near the entrance said to seat yourself. I asked my mom to grab a high chair on the way by and I went to a large round six top table in the part of the dining room near the kitchen. We didn’t need a table that big, but I didn’t want to sit in a booth with the baby either, so I pushed some chairs aside and put B between my aunt and myself. The menus were already on the table, so I handed one to my mom and my aunt. I had to reach to a table behind me to grab a third menu which we put back as soon as we were done with it. 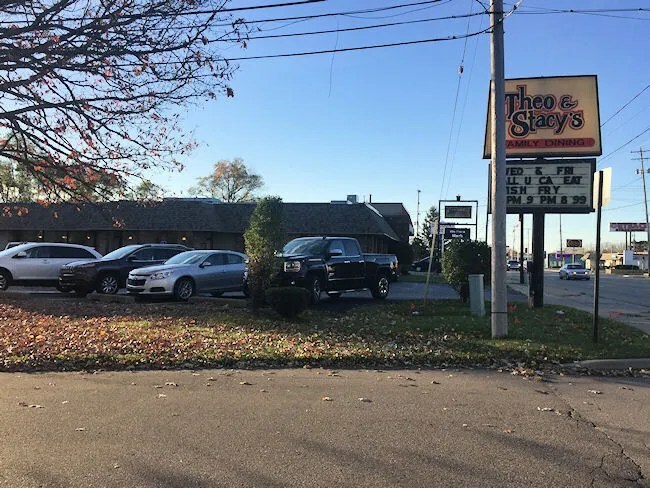 Theo & Stacy’s is the classic Greek diner and it’s the name you associate with Greek cooking in Kalamazoo. Both Theo & Stacy immigrated from Greece. They were married in the late 60’s in New York then moved to Kalamazoo to open a restaurant. The couple is known for their free Thanksgiving dinners which they started doing in 1977 and continue to do to this day. They also organized Kalamazoo’s Greek Festival which ended it’s run as an outdoor festival in 2016 and will move back to a small, indoor festival starting in 2017. 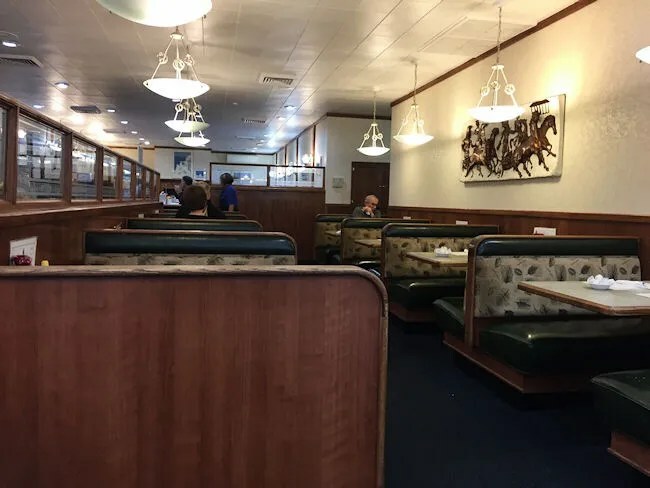 The diner reflects the humblness of it’s owners. There is nothing fancy about the decor or the space and the break menu is very simple, but very delicious. The lunch and dinner menus feature more Greek specialties while breakfast tends to stick to the classics. There was no steak or Eggs Benedict on the menu, so I had to find something else. 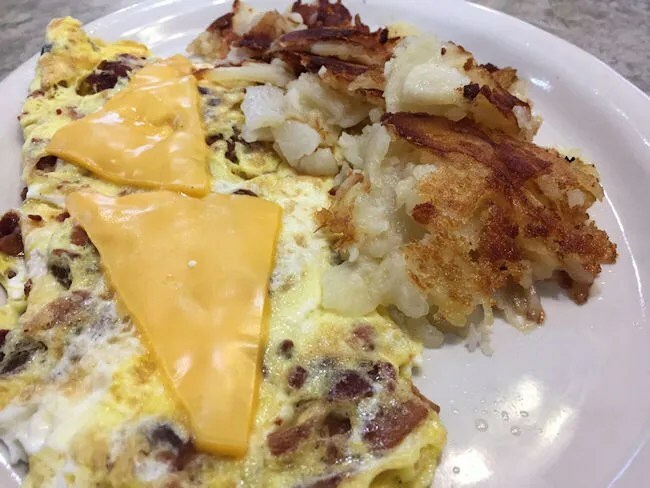 I happily settled on the bacon and cheese omelette which comes with American fries and toast. 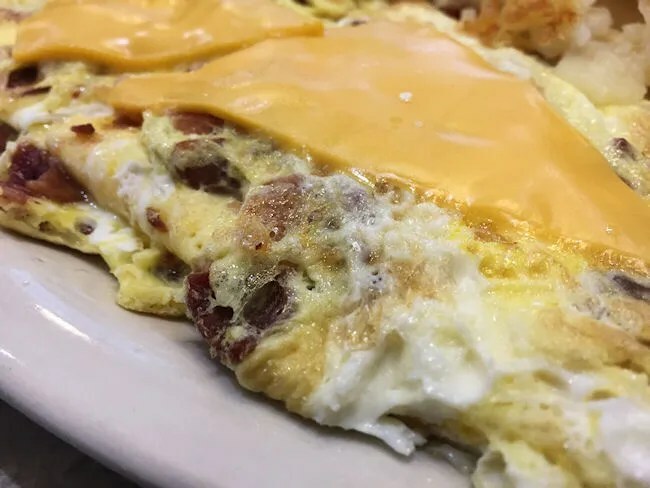 The omelette’s at Theo & Stacy’s are large three egg omelettes that are topped with a couple of slices of American cheese. The tender, fluffy eggs were holding quite of bit of bacon and cheese on the inside. With a little bit of pepper from the shaker on the table, this omelette didn’t last long on my plate. The American fries were more of a sliced potato than a shredded one. The outer layer was very crispy and delicious, but underneath that was very soft and mushy. I really like my breakfast potatoes on the crispy side of things, so I ate what I really liked and sort of picked at the rest of it. I was hungry and it was still pretty tasty…just not the way I prefer it. The toast was pretty typical white toast with butter. It was served with a couple of jelly packs on the plate next to it. My mom ordered the French Toast and added on a side of bacon. There was nothing too fancy about her selection, but it was solid and delicious. The bacon came out nice and crispy and we shared some of it with B so he would have something other than my toast to snack on. My aunt went big. She ordered the Blueberry Pancakes. The waitress asked her if she was hungry and my aunt said yes….not knowing how large the pancakes were going to be. She got three pancakes that were each almost larger than the plate they were served on. 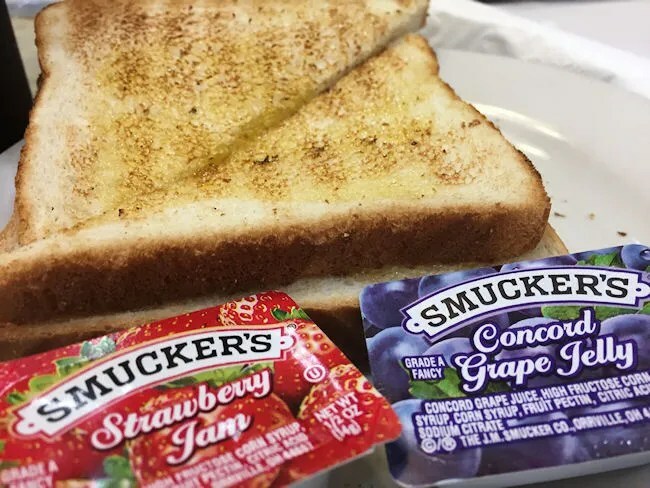 They came with blueberries cooked in to the them wit butter and syrup on the side. My aunt’s not a big eater so she got through maybe half….maybe. I asked for a box to take the rest home because there was so much there and I thought L would enjoy them for breakfast later in the week. After we were done, the waitress told her she could have had the option for just one of the pancakes….that would have been nice to know in advance. Our bill for the three breakfasts came out to around $20. They have a cash register near the door but the waitress asked if we wanted her to take it so we did. My mom never tips on the credit card (she’s a waitress herself and she prefers cash tips, so that’s what she when she’s the customer), so we left a few bucks on the table as well when we walked out. There’s a reason Theo & Stacy’s has been around for forty years. They are the classic diner that every community needs. You know you’re always going to get a good meal and it’s not going to cost a fortune. 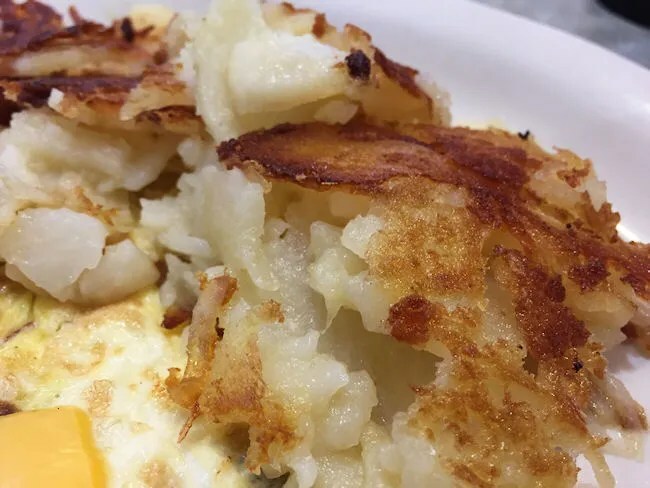 Theo & Stacy’s is not one of those places that is going to reinvent breakfast, but they’ll consistently serve up a hearty, tasty meal and you’ll always be able to count on that. Thanks for this. I’ve been by this place on Westnedge a bunch of times when in town but never knew what it really was. I’m intrigued by the choices on the Greek part of their menu. There looks to be some really good stuff on there. 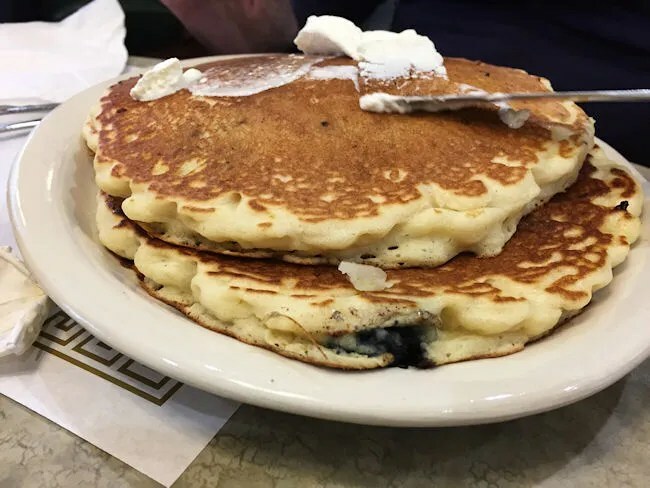 I’ve never eaten anything but breakfast at any of the Theo & Stacy’s, but they’re both Greek immigrants and the place has been around for quite a long time…so it might be worth a try if you’re in to Greek food.